Daoji (道濟 1130-1209), commonly known as Ji Gong (濟公 or 濟公活佛, Master Ji, Rinpoche Ji Gong), was an Buddhist monk during the Southern Song Dynasty in China. He was born with the name of Li Xiuyuan. (李修缘) Dao Ji was also called Hu Yin (Recluse from the Lake) and Elder Fang Yuan (Square Circle). He was a monastic at Ling Yin Temple near Hangzhou. Even though his eccentric behavior broke the rules of the vinaya (traditonal code for monastics), Daoji had a kind heart and was always ready to lend a helping hand to ordinary people. Unlike a traditonal Buddhist monk, he ate meat and drank wine. The monks then had enough of his behavior and kicked him out of the monastery. From then on, Daoji roamed the streets and helped people whenever he could. While cultivating in the Buddha’s teaching, Daoji acquired magical powers. Since many people noticed his compassionate nature, many started thinking of him as an incarnate of a bodhisattva, or as a reincarnate of an arhat. When Daoji passed away at the Jing Ci monastery on the 14th day of 5th Lunar month (17 June 1207), Syncretic Taoism adopted him as a deity. Not long after that, even Buddhism began to respect him, and added him into the list of arhats. The I Kuan Tao also adopted him into their pantheon of deities. The life of Daoji has also been popularized in a TV series, which aired in 1993. 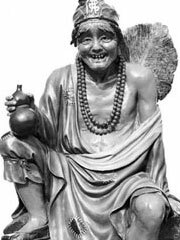 Daoji can usually be seen smiling in his tattered monastic robes, and usually carries a bottle of wine in his right hand, and a fan in his left hand. He wears a hat with the Chinese character Fo, meaning «Buddha». He can also be seen holding his shoes in his right hand.